There are a lot of people who are forced to stand on their feet for a long time, day in and day out. Whenever it comes to working while standing, it might often seem like there’s basically nothing that you can do so as to avoid having excruciating pain towards the end of the day. The joint pain and muscle soreness that usually come along with working in a hospital, a retail store, a restaurant or any other workplace that does not give you adequate free time to sit down can turn out to be debilitating and it might seriously affect the rest of your life. Don’t you like to have the opportunity to actually do things during your time off instead of having to soak your feet with hopes that you will be able to walk the following day? Fortunately, that should not worry you any longer because there are lots of shoes that have been specifically-designed to make it easy for you to stand all day long without any hassles. In this review, we will take a closer look at the best shoes for standing all day, irrespective of where you usually work or if you are a woman or a man. 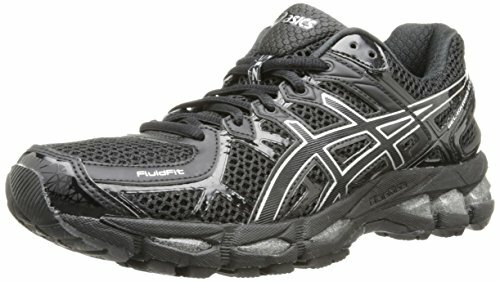 Mainly made for marathon and long distance runners, the Asics Gel Kayano 21 is one of the Asics’ midweight shoes. It has been made using a gel that’s common to all the Gel-Kayano series. This feature enables your heel and toe to have a much smoother feel. The Asics Gel Kayano 21 also promises arch support and personalized fit to the users through the memory foam-lined heel. Furthermore, Asics Gel Kayano also boasts of 2 of the latest top-of-the-line updates to the midsole and upper parts –FluidRide midsole and FluidFit upper. Asics also utilizes the middle density SpEva 55 technologies in the midsole to increase its responsiveness without being overly cushioned or too stiff. The Gel-Kayano 21 shoes also offer superior stable cushioning. The model’s design also employs the premium stability materials that are arranged in Asics signature IGS (Impact Guidance System). The system works well to link all the sole features together for a stable and nice ride. The Asics Gel Kayano 21 is also durable. The solid construction and premium materials means that this shoe has been built to withstand great deals of wear and tear. With more than 30 years in the industry, Skechers knows well what works and what does not. They have certainly put ample time into understanding their wide range of footwear and the Skechers Loving Life Memory Fashion Sneaker is not an exception. Judging by the appearance alone, they definitely know what looks nice in a shoe. The best feature that stands out on these sneakers is the fact that they have used memory foam so as to keep the feet comfortable regardless of how long you’re up on your feet during the day. Being slip on shoes, the Skechers Loving Life Sneakers are also more comfortable than the other shoes in the market. The pure comfort features of these shoes might not be the most important offering, but it’s certainly something which can’t be denied. The shoes also have a Flex Groove outsole that’s slip resistant. The sole has been designed to prevent you from sliding even on the worst days. 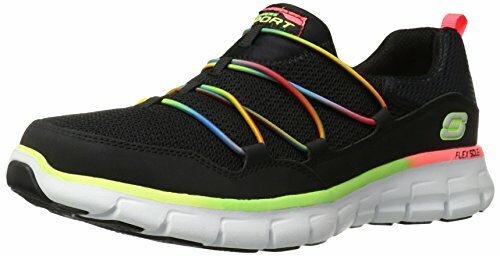 Skechers Loving Life Sneaker might not have the grip power that other shoe brands have yet it’s still incredibly strong. For affordable pair of shoes for standing all day, this is your perfect fit. Skechers is a well-known brand that you can always trust irrespective of what the competition says. The Hush Puppies Shoe version of the classic Mary Jane combines form together with function in a comfy package. The shoe has soft leather options that come in 3 main color options so as to give your shoe style a unique makeover. There is also a sweet single strap that encloses this shoe and a microfiber lining that creates soft stepping experiences. Furthermore, the latex foam footbed has been designed to provide ongoing as well as lasting comfort. The flexible and lightweight outsole has also been perfectly-designed to absorb shock. It also contains the Zero G technology for an amazing comfort. The grip treads on these shoes provide traction for sure footing. In addition, the 1.25 inches heel gives the right lift. The shoes are cute and stretchy. The Hush Puppies Shoes are comfortable right from the box. However, it is important to note that the Hush Puppies Shoes might have a narrow fit (particularly in the toe) thus you should consider ordering up in case you have a wider foot. Clarks has been a respected provider of durable and reliable office shoes for the women who want traditional styles in shoes that provide a great fit and look. The style of Clarks Women Haydn Harvest Flat shoes is pretty elegant and simple with a slip on shape. There’s also a patternation of leather that makes the shoe to stand out. This patternation also ensures that the shoe is well suited to both professional as well as more casual outfits. The buyers usually receive subtle lizard prints in either brown or black colors. The other benefit that you will get from these slip on pair of shoes is the fact that they are kind to the feet as you walk around all day thanks to the wide range of comfort features. The OrthoLite footbed is also there to cushion your foot for longer time periods while the outsole has been designed to offer shock absorbency. The combination of these features ensures that they are protected with every step that you make around the workplace. If you work for long hours while standing and you occasionally experience heel pain, then Dansko professional clog shoes are there for you. These shoes will protect your feet thanks to the thick and stiff soles as well as superior arch support. Dansko is a recognized brand that offers quality shoes for individuals who have to be on their feet for a long time. It also has an extensive range of styles and colors, so you will always be sure to find an ideal pair that suits your needs, whether you have work use or casual use in mind. The individual specifications might vary depending on your style of choice. The Dansko Professional Oiled Shoe For Women fits the bill. It has been well-designed so as to follow natural contours of the foot. As a result, the shoe can accommodate a wide range of foot types. The Dansko professional clog shoes also feature an instep collar that cushions your arch thus enabling you to walk in comfort. The Heel Counter on this shoe serves as the natural shoe horn. The features allows your heel to move down and up as you walk, without having to cause any blisters. With the perfect amount of flexibility and shock absorption, the outsole has been designed to propel your foot forward as you walk. This makes long distances to be more manageable. The oiled leather materials also promise durability. Protect your back, feet and legs when you are on your feet all day using the Dansko Professional Oiled Leather Shoe. Timberland is among the largest manufacturers of boots. In addition, they have also made a name for themselves by producing the best women’s shoes for standing all day. The Renova Slip-On shoe is a perfect example of their high quality shoes. With a micro-suede upper and premium leather construction, these shoes are meant to put up with long days on the job and last for a longer time. The unique Anti-Fatigue Technology stands out on this model. It consists of several features that keep the back, feet and legs supported all through the day. It also absorbs all socks that usually come with walking for a long time. In order to keep you more comfortable all through the day, Timberland has created the Tri-Density foot bet which features the Outlast Adaptive Comfort. This makes sure that you have the perfect amount of temperature regulation and support so that the feet aren’t overheating or lacking the right form of protection. In regard to safety, there is a SafeGrip outsole that’s used to keep your footing very secure both in dry and wet conditions. This will enable you to move quickly without ever having to sacrifice your safety. For one of the best options in the market, you should look no further than the Renova Slip-On Shoe from Timberland. Steve Jobs might just have been famous by wearing the New Balance shoes during Apple presentations, but these shoes have now developed to become some of the top slip resistant shoes that are ideal for standing all day while on the job. The footbed of the WX626 Slip Resistant shoes is made using EVA foam that’s flexible enough to enable you to move easily. It is also firm enough for purposes of supporting the feet for several hours while at work. Having the right type of support for the arch is among the most important factors that you can look for in a pair of shoes since it will help to fix the bad habits that you might have had for several years. The leather upper of these shoes ensures that they can stay strong and last for years. The New Balance WX626 Slip Resistant shoes are incredibly powerful for women who want a pair of shoes that will not wear out within a few months. To finish off the perfect design, the manufacturer has also included the slip resistant sole that will keep your footing very secure whether you’re on a dry or wet floor. For safety while on the job, you should never take anything less than The New Balance WX626 Slip Resistant shoes. 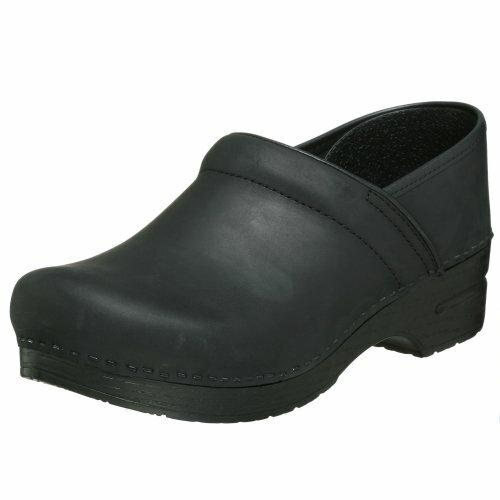 Whether you work in the airline industry, healthcare, hospitality or food service industry, the Crocs Unisex specialist shoes have been designed to provide you with comfort and support. In fact, they are considered as one the best pair of shoes for standing all day. The shoes come in a wide range of designs and they are intended to be both practical and stylish. Furthermore, they are strong and durable enough to help in protecting feet from spills in hospitals or in the kitchen. If you want to stick to your budget, then these are the perfect shoes for you because they are more affordable as compared to other protective and supportive shoes that you can purchase. With attractive colors, tons of comfort and a little personalization, Crocs Unisex specialist clog shoes has all features that you can expect from any Crocs shoes. The Crocs Specialist clog shoes specialize in offering comfort from the heel to the toe. The shoe has also been well-designed to meet all workplace standards with a closed toe and heel. The Exclusive Croslite material on the shoes conforms to your foot for a custom fit. Furthermore, the enhanced arch support provides all-day comfort. There are also tiny nubs along the footbed that provide a massage-like feel. The loose fit will allow your foot to expand and bend naturally while the thicker metatarsal area helps to protect the top area of your foot. The Crocs Unisex specialist clog is easy to clean using soap and water. Dansko is popular for their all-day comfortable pair of shoes and the Wyatt loafer does not disappoint. 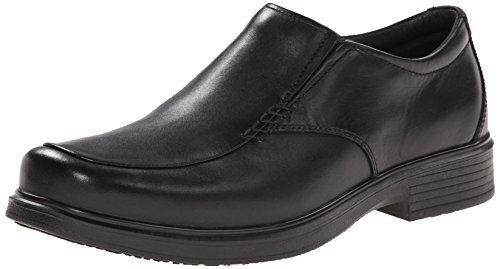 These full grain, soft leather loafers usually come in mocha or black options to fit all your work fashion requirements. The lace ties and padded collar provide an individual fit. The Dansko Wyatt loafer also has an antimicrobial sock and the leather lining that wicks away moisture while also helping to keep feet dry, cool and odor-free. The cushioned removable footbed will also allow you to sink into an all-day comfort or even add your personal orthotics for a perfect tailor-made support. The Wyatt loafers are fairly lightweight and they have a low profile that allows for an active lifestyle. The thick grip rubber outsole and polyurethane midsole absorbs shock and provides extra durability to these shoes as well as extra energy to your feet. The sole also carries a Seal of Acceptance from the Americas Podiatric Medical Association (APMA). Even though these shoes are often true to size, they only come in the medium width. As a result, in between sizes or even those who need more girth might benefit from ordering up a half to whole sizes above their normal size of shoes. Dansko has been producing some of the best pair of shoes around. The Dansko pro oiled leather clog is a flagship shoe coming from Dansko and it is among their all-time best. To start off, Dansko has included a high quality leather upper that is seriously built to last for a long time. The shoe also comes with the additional benefit of fitting into natural contours of the feet. Natural leather usually has the unique ability of growing more comfortable as time passes on. The PVC inner frame will protect you at work by keeping your feet stable together with a Stapled Clog outsole and a Rocker bottom that’s slip resistant. This prevents you from slipping irrespective of the conditions that you work in. This combination is among the best in the industry and something that you’ll not find anywhere else. Great safety features, high quality construction and unbeatable comfort levels come together in this shoe like never before. In case you want a great pair of shoe that’s going to serve you for many years to come, then look no further than the Dansko pro oiled leather clog shoes. Over the past decades, Timberland has managed to build a respectable name for themselves as a top-quality shoe brand. The type of craftsmanship that Timberland has is absolutely unparalleled within the industry. This is especially true when you’re looking for the best shoes for standing all day. Beginning with the full-grain leather uppers that are incredibly durable, the brand has made sure that the shoes have been built to last long. The leather might sometimes be hard to clean but it is still a great pair of shoes to buy. Timberland has also included a Scotchgard protecter that’s stain-resistant and also keeps them quite easy to clean. In order to keep the feet comfortable, you can always take advantage of its Anti-Fatigue technology that offers support and cushioning, leather lining as well as a TPU outsole that offers a better grip. By combining the unique comfort level as well as the stability, there are literally very few things which you won’t be capable of tackling at work. That is exactly why Timberland Professional Five-Star Meurice is among the most recommended shoes in the hospitality industries and restaurants. For people who work on their feet throughout the day, there are few options that can actually beat the quality that this shoe provides. Rockport Company first launched their lightweight shoe line back in 1983. They decided to join forces with the Adidas in 2006 so as to incorporate the sports technology in their footwear. As a shoe industry innovator, the Rockport World Tour Classic Walking Shoes for Men is among the Rockport’s crown achievements. The shoe has been made using the best materials only including the soft pebbled leather. The water resistant uppers are available in 3 leather options or 2 nubuck suede choices so as to accentuate any shoe style. The Full Strobel construction and gently cushioned footbed aids in all walking motions while still keeping this shoe flexible. 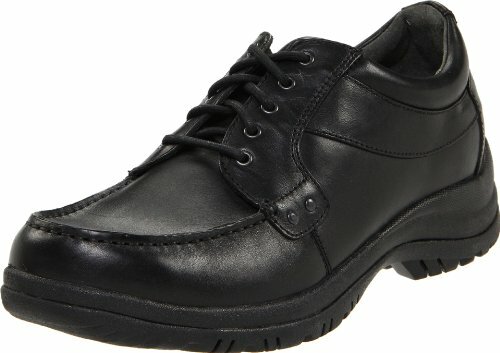 The Rockport Classic Walking Shoes is a business casual dress shoe that conforms to your foot and also reduces leg fatigue through the lightweight shock absorption. The extended heel counters and flexible forefoot provides easy motion controls without the extra weight of the traditional motion control pair of shoes. The shoes do tend to run narrow. As a result, you should consider trying them out before buying or just order a size that’s bigger than your norm. Skechers is one of the most recognizable and top selling shoe company across the world. They have maintained the top spots by offering a wide range of style, support, fit and comfort options so as to gain the loyal following of their widespread global customer’s base. 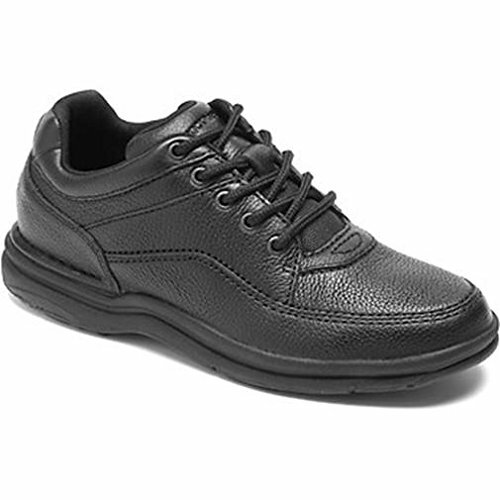 One popular option they offer is the Skechers for Work 76690 Keystone Sneaker Shoes for Men. Available in soft pebbled black leather, these attractive slip-ons take you anywhere your feet need to go. The Skechers for Work shoe has been built with the slip resistant outsole and it meets even the most strict design and safety requirements. 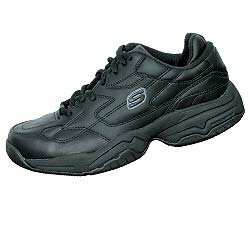 This all-black pair of shoe is comfortable and OSHA compliant, making the model your best bet in case you’re in a manufacturing or service environment. The slip-resistant sport shoe also comes with an internally padded comfort collar. The shoes also have a durable and breathable ultra-lining. Other important features include the Mark II slip, oil-resistant rubber outsoles, lightweight compression-molded midsole, smooth black leather upper and cushioned, removable and contour molded polyurethane insole. There’s a lot of consideration that goes into selecting the right type of shoes. Armed with this knowledge, you will be capable of making the decisions much easier. By understanding that shoes need the right construction material, the right kind of support, the right amount of padding as well as slip resistant soles, you will be sure to have a pair of shoes that will certainly serve you well for several years to come. Here is a complete guide on the factors to be considered when choosing the best shoes for standing all day. This is essentially a no-brainer. In case you are going to stay standing for a long time then your shoes should be secure enough to enable you make it through the work day. Slipping at work is among the most common problems that people usually face whenever they work on their feet for a whole day. As a result, you should make sure that this doesn’t become an issue for you by choosing shoes with slip resistant soles. The type of material used in constructing ideal shoes for standing all day is also important. Even though there are several options to choose from, some construction materials are more popular as compared to others and with good reasons. Genuine leather is possibly the most frequently used construction material. Genuine leather has also stood up to the test of time by proving that it can be the most sturdy construction material as well as the most comfortable material in many cases. Other materials used include rubber and synthetic materials that will greatly help you to safeguard the feet in case you work in places that tend to make your feet dirty. Comfortable shoes for standing all day require just the right type of arch and heel support. There are very few things that can have this kind of impact on your comfort both while you’re standing and also after you’ve gotten off the shoes. As a result, you should always look at the heel and arch support before purchasing these shoes. Padding is what majority of people think of anytime they picture a pair of comfortable shoes. Even though padding might not be the only factor, it is mostly the first feature that people notice when they expect to have a long day ahead. It’s important for your shoes to have just the correct amount of padding since too much padding can cause other foot problems. When all’s said and done, your feet are what supports your whole body all through the day. Anyone who spends his/her days on their feet knows well the side effects associated with long days at work. The pain which echoes throughout the body and the many days of recovery that it takes on weekends will definitely put a serious obstacle on your life. However, when you arm yourself with the right shoes on your feet, you can always take a lot of this sting out. The important thing to do is choosing the right type of shoe. There are lots of shoe options out there in the market but how will you know the best one that’s suited for you? It is actually not that difficult, now that you’ve learned everything about the top models that are available in the market today.